The plumage of the snowy egret really is quite spectacular. Among the most elegant of the herons, the slender snowy egret sets off immaculate white plumage with black legs and brilliant yellow feet. 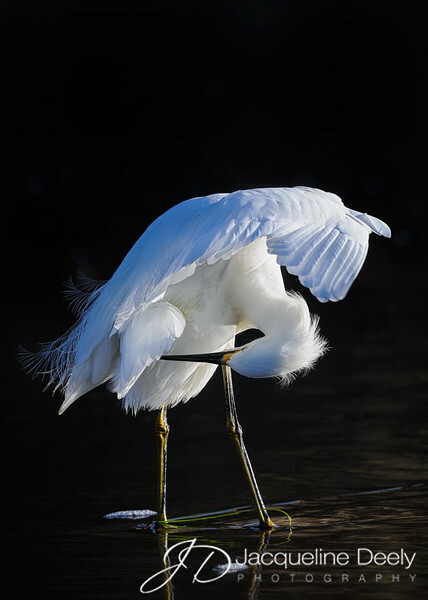 During the breeding season, adult snowy egrets develop long, wispy feathers on their backs, necks, and heads. Once the victim of aggressive plume hunting for the fashion industry, snowy egrets have been protected in North American since 1918 under the Migratory Bird Treaty Act. In 1886, plumes were valued at $32 per ounce, twice the price of gold at that time. The legislation prohibited the hunting of egrets for their plumes, and helped them regain their former levels of abundance. Snowy egrets today may be threatened by chemical contamination and oil spills, yet their biggest continuing threat is habitat loss: more than 100 million acres of wetlands in the U.S. have been drained since colonial times (when total wetland area was estimated at 127 million acres). This image was captured on a sunny winter's morning when there were a large number of these birds congregating on the beach. I was treated to this beautiful scene as the egret raised its wing in order to preen, allowing the light to illuminate the body and exquisite feathers.